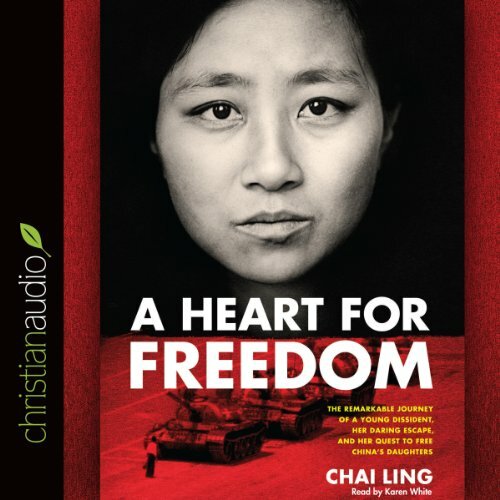 The dramatic and fascinating story of Chai Ling, commander-in-chief of the student protesters at Tiananmen Square and witness to the massacre of thousands of Chinese civilians. Risking imprisonment and possible death for her leadership role in the student democracy movement, she was on the run in China for 10 months while being hunted by the authorities. She eventually escaped to the U.S., completed her education at Princeton and Harvard, found true love, and became a highly successful entrepreneur. But her desperate quest for freedom, purpose, and peace - which she had sought in turn through academic achievement, romantic love, political activism, and career success - was never satisfied until she had an unexpected encounter with a formerly forbidden faith. Her newfound passion for God led to her life's greatest mission: fighting for the lives and rights of young girls in China. If you could sum up A Heart for Freedom in three words, what would they be? What was one of the most memorable moments of A Heart for Freedom? So many parts of this I remember. I love the courage, the honesty, and the will to live displayed by Chai Ling, and the other students. There are moments that are truly sad, however the love of Jesus overshadows and conquers those moments in Chai Lings life. Truly remarkable story... a must read. She made you feel like you were right in the story. Both, and inspired me to move past my own fears. Absolutely--this book not only gave a historical context of China in times of uprise, but it gave me a new insight of the oppressive pressures that the Chinese people experienced. I had never been taught about this massacre in school, and it bothered me when I found out about it only a few years ago. I am in my 30s and was alive during the Tiananmen Square Massacre, though quite young at the time. Regardless, I feel like it is something I should have been taught about in school. Chai Ling is now a Christian living in the US working for All Girls Allowed, trying to save the girls throughout Asian nations that are looked down upon, sold into sexual slavery, and more. I had been aware of her organization before I found out about her survival from the massacre! A few yeras ago I saw the documentary that Chai Ling mentioned in this book. I actually found her brilliant in that documentary and I did not look down at her or read things in the way that she says many had from it about her. She made me cery curious to want to research the massacre more. It was later that I realized that the founder of All Girls Allowed and the student leader from the protests and such were one in the same!! I think that is what I liked best about the story. It is great to piece things together like that and see the connection. She was very honest in her story and told things from her past that were obviously very difficult, especially the relationships she had during her college years. It was great getting to learn about her her family as well..
Chai Ling of course, since it was her story! I definitely wanted to hear more and more after closing the app on my phone. I listened to it while quilting and soetimes would prolong my quilting just to hear more! If you are not a CHristin, I think some of this may be difficult to listen to, but have an understanding of the person that she once was and the person she has become. It is definitely great to see that she still has a great passion and is still an amazing speaker!!! Yes. This book was compelling and tragic, full of hope and despair. Others have indicated the narrator's breathing habits, but you really don't notice them much; Ling's story is so compelling. yes, when Ling found love and faith. I enjoyed this book immensely, with the exception of Ling's propensity toward waxing spiritual towards the end. While it is part of her journey, it seemed to come from nowhere and dragged on (describing the sacred spaces, etc.) The narrator's Chinese pronunciation may or may not have been accurate; it is hard to tell, but she did make many names sound the same. This is, however, on the whole, a welcome addition to anyone interested in modern Chinese history.